Beaucaire, a picturesque town of Southern France that boasts an impressive architectural and cultural heritage that earned it the label City of Art and History. 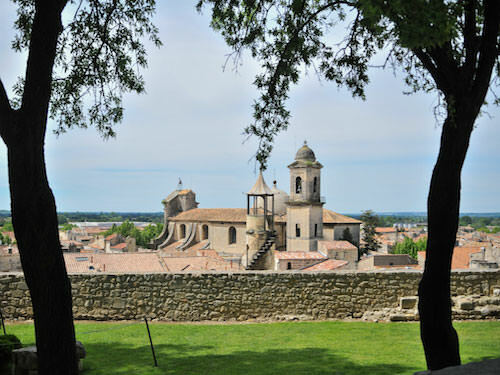 Perched on a promontory overlooking the Rhône River, it lies in a triangle delineated by Nîmes, Arles, and Avignon, at the crossroads of Languedoc and Provence historic regions. 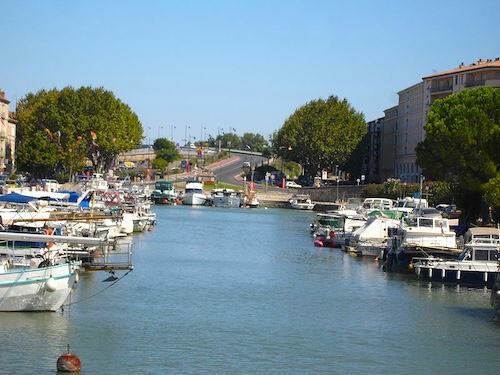 Established in the vast alluvial plain on the right bank of the river, it is also the start of the Canal du Rhône which flows into the sea at Sète. A few hills, however, dominate the plain, to the north of town; this is where the inhabitants once built their castle and the monks an abbey dedicated to Saint-Roman. Beaucaire has since expanded and joined the city of Tarascon, located on the left bank of the Rhône, just opposite in the department of Bouches-du-Rhône in Provence. Here's a little bit of history to start. Founded in the 7th century BC, it grew in importance as it became one of the stopover towns along the Via Domitia. The Roman Proconsul Cneus Domitius Ahenobarbus built this road in the early 1st century AD to connect Italy to Spain. Beaucaire was then called Ugernum. In 121AD the Via Domitia was split in several branches that originated in Ugernum to serve the cities of Nemausus-Nîmes, Arelate-Arles, Remoulins and Pons Aerarium-Saint-Gilles. 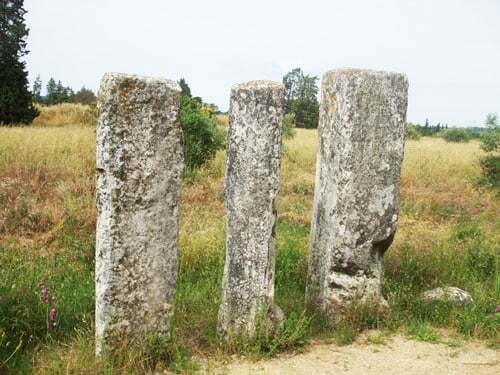 Milestones, discovered on the plateau northwest of the town, are witnesses of this period; they stand on the right hand side of the Via Domitia. These standing stones come in groups, as a new milestone was added next to an existing one each time a new emperor repaired the road; they are known as Columns of Caesar, as each was dedicated to an emperor. Thirty-nine whole or partial milestones have so far been uncovered. Perched some 80m above the Rhône, Beaucaire developed around its medieval castle, the residence of the local lords and Counts of Toulouse. Unfortunately, the castle is today mainly in ruins as the Catholic Richelieu partly dismantled it after the Wars of Religion of the 17th century. It has, however, retained an odd polygon-shaped dungeon fiercely standing at the edge of the cliff, as well as the base of a round corner tower that was the counterpart of the polygonal tower. Nothing is left of the manor house and the ramparts, but the latters’ foundations are clearly visible. 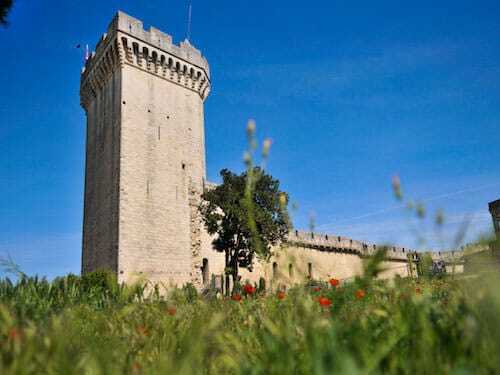 The Chateau de Beaucaire was classified Historical Monument in 1875; it is open to the public and regularly serves as setting for historical re-enactments. The ducal chapel, the early 13th century Chapelle Saint-Louis, was classified historical monument in 1946. It escaped destruction and has retained its Romanesque tympanum and open bell tower. The castle’s ground also houses the Musée Auguste Jacquet, a regional museum that exhibits local archaeological finds, arts and traditions. It sits in a elegant garden planted with pines and cypress. Let's go back to the High Middle Ages when the barbarian invasions forced the inhabitants to build the first rampart and enlarge their castle. 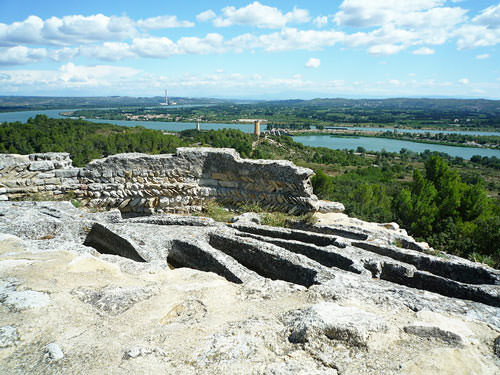 The Roman Ugernum became known as Beaucaire (beautiful stone), a citadel of stone. However, these invasions and the disturbances they generated slowed its development. Louis IX changed the course of history in the 13th century, when he attached the bailiwick of Beaucaire to the French Kingdom. The king‘s recurrent visits brought great prestige to the little town and led to a demographic expansion. As a result, the Foire de Beaucaire, which was founded in 1217, grew in importance to become the largest fair in France. Indeed, located at the mouth of the Rhône River, therefore easily accessed by land and waterway, Beaucaire enjoyed a privileged situation. The fair gained international fame in the 15th century as it extended its influence on the Mediterranean Basin, the Middle East and Europe. It reached its heydays in the 17th-18th centuries. It took place over 10 days, from July 15th to 25th, and generated a volume of business similar to that of the port of Marseille over 1 year! It was renamed Foire de la Madeleine to honour St. Marie-Madeleine (Mary Magdalene), the patron saint of the city, who is celebrated on July 22. Foreign and French merchants arrived by boat, sailing up the Rhone delta, the Saône, Rhône or Isère rivers. They initially met on a large mall, on the riverbank; however, the overwhelming success of the fair forced the mayor to extend it to the entire town in the 18th century. Beaucaire was thus a huge market; merchants occupied every inch of land in the narrow streets and the mansions courtyards served as warehouses! Interestingly, the French Revolution had a negligible impact on the fair. However, the construction of the railway in the mid 19th century triggered the decline of the river trade and put an end to this golden era. The fair still exists but in the form of fairground with bullfights and various festivities. The Fêtes de la Madeleine always start on July 21st and last at least 6 days; a Must See when in the region! 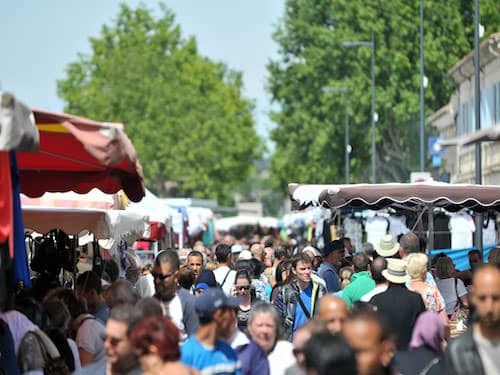 Amazingly, the international Foire de la Madeleine turned Beaucaire into one of the richest cities in France from the 17th to the 19th century. 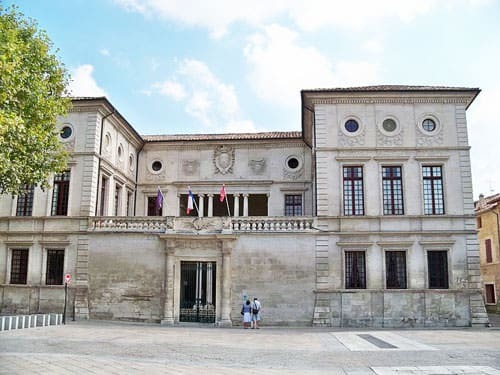 During this golden period, the wealthy merchants of Beaucaire built the opulent mansions that today contribute to the town’s architectural heritage. The Hôtel de Clausonnette, Hôtel Domergue, Hôtel de Fermineau, Hôtel de Linage, Hôtel de Margualier (Hôtel des Caryatides), Hôtel Roys de Ledignan and Hôtel Dulong ... are among the finest mansions. So is the town hall. The architect Jacques Ubizol and Alexis de la Feuille, the Inspector of the Royal Buildings, built it in the 1860's to accommodate the Headquarters of the Fair's Curators. Sculptures of the official measuring standards of the time, namely the cane of Montpellier and the aune of France, still adorn its facade. You'll also find the double royal sun crowned with a banner that bore the town’s old motto 'famous for its fair, illustrious for its fidelity'. 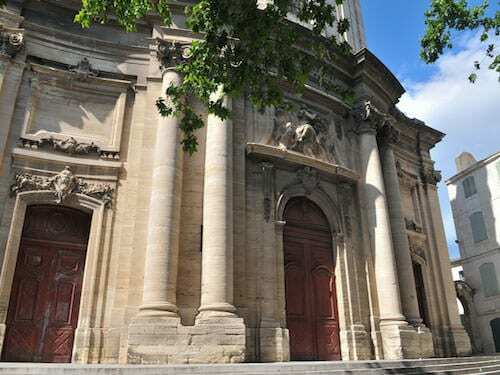 Beaucaire also boasts a wealth of religious architecture. Notre-Dame-des-Pommiers, a 18th century Baroque-style collegiate in the centre of town, was classified historical monument in 1932. It contains a Romanesque frieze recovered from a previous building. This frieze consists of twenty 90cm high panels; a 13.70m section depicts 11 scenes drawn from the theme of the Passion. Saint-Paul Church is the former chapel of the Cordeliers Convent. The monks built it in the 17th century right in the centre of town to benefit from the international fair. It contains the only painting by Jacques Reattu (1760-1833), a painter from Arles, a triptych that illustrates the life of St. Paul; The Prediction of St. Paul, The Baptism of St. Paul and the resurrection of Utica. 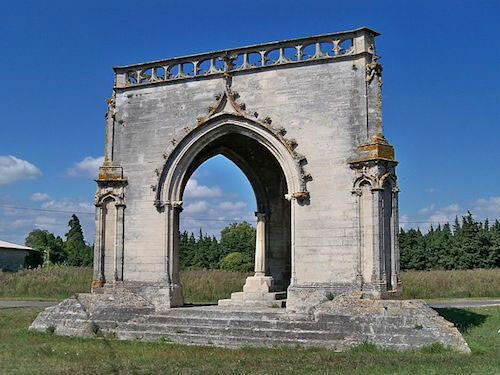 The Gothic Oratoire Croix Ouverte is a triangular open chapel that shelters a Cross. Built in the late 14th century, it is one of 4 remaining, all located in the south of France. Legend has it that it replaces a modest chapel that temporarily sheltered the remains of King St. Louis who died of the plague off the coast of Tunis during the 8th Crusade. It was listed Historical Monument in 1904. In the 5th century, hermit monks built the Abbey of Saint-Roman in the cliff that overlooks the Rhône, north of town. A couple of centuries later, they dug a chapel in the belly of the cliff to shelter the relics of Saint-Roman. It is said that the holy man's tomb contains his right hand and a part of his right foot, but also fragments of Saint-Trophime's right foot. The abbey was active until 1528, then slowly fell in ruins. However, the many vestiges give us an excellent overview of the monastic life; the seat of the abbey, carved from the rock, the monks’ cells, the common room, the cloister, the wine-press as well as the cisterns and the cellars. The necropolis, on the upper terrace, has more than 150 sarcophagi (now empty) cut in the rock. It enjoys prime views of the Rhône Valley and Mont Ventoux in the background; a perfect spot that induces to reflection. 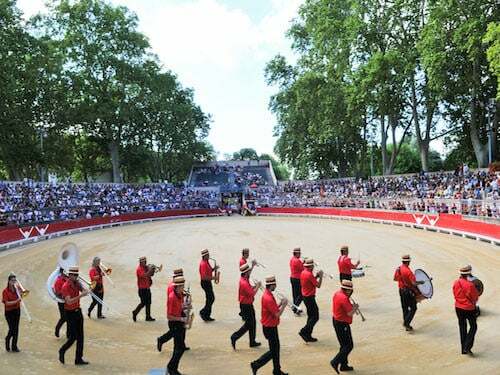 Finally, Camargue evokes bullfights and Beaucaire is proud to be the cradle of this local tradition that dates back to the Middle Ages. 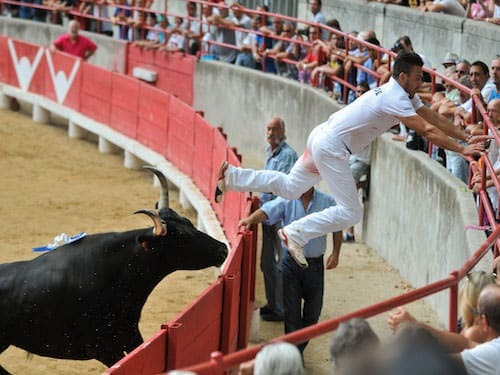 That said, it’s important to say that the course Camarguaise is not a corrida, and that bulls are therefore not put to death! The Paul Laurent arenas were built in1902 to host bullfights, but also sports meetings; they can accommodate 600 spectators. 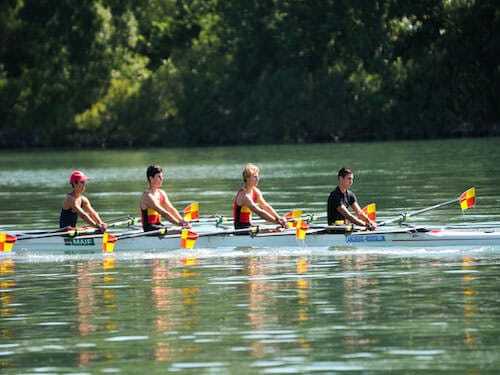 Interestingly, the State Secretariat for Youth and Sports recognized the Course Camarguaise as a sport. Here are all the links to discover more about this amazing city.